Free Wi-Fi, sleeping 2 to 5.
in a fine Georgian house, built in 1791. 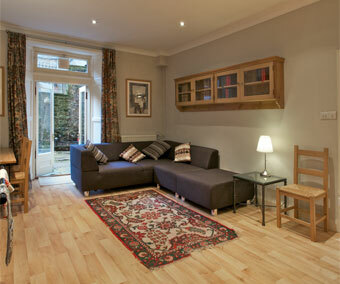 2 minutes walk from Princes Street. 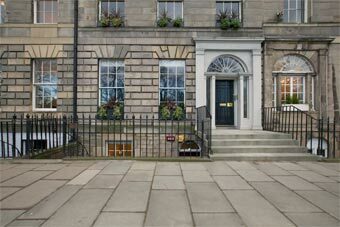 The whole of the lower ground floor of this handsome Georgian town house has been made into a modern self catering apartment by Lucy Perriam who lives above. 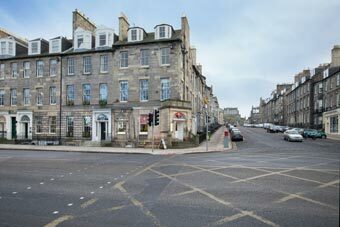 Around the corner is North Castle Street and then you are on Princes Street with Edinburgh Castle straight ahead. From here you can walk to virtually anywhwere in Edinburgh, and there are masses of places to eat and drink around about, and a convenience store just up the road. Entrance is through the gate in the railings down stone steps. 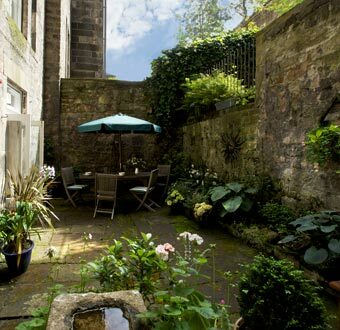 There are two doubles and a single bedroom, with a shower room, large kitchen/living room, and access through french doors to a stone-flagged courtyard where you can sit out for lunch or a drink in the evening. Because Lucy lives in the house above she is on hand and delighted to advise about local shops and restaurants, and indeed anything to help make your stay pleasurable. She can also lend you keys to the private Queen Street gardens just opposite the apartment. 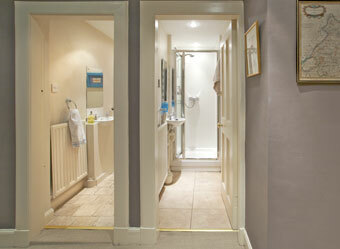 Below left; wc and basin, next to shower-room and basin. 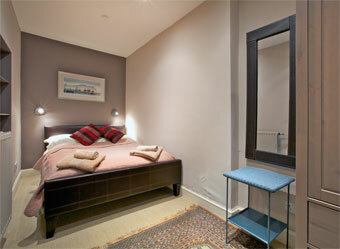 Below right; Single bedroom. Two views showing the sofas in the sitting area and kitchen area with long sideboard counter, Aga style cooker (electric and gas) and big flat screen TV (freeview and DVD). You can see the pull-out dining table at the end. The french doors go through to the flag-stone courtyard where you can sit out. Another view. 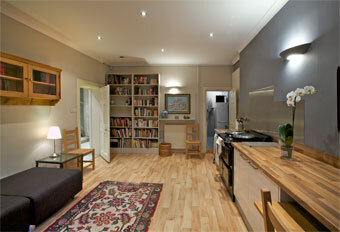 Straight ahead is a small room with washing-up sink, dishwasher, washing machine and fridge/freezer. Lots of interesting books in the bookshelves. Free Wi-Fi for your laptop. Lucy provides a complementary breakfast hamper for your first morning! 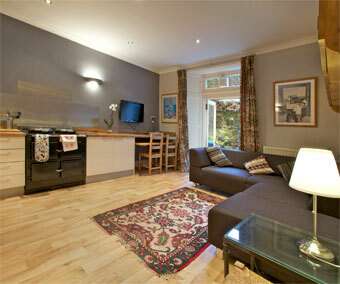 'Beautiful appartment and lovely hosts'.... Evita UK tour. 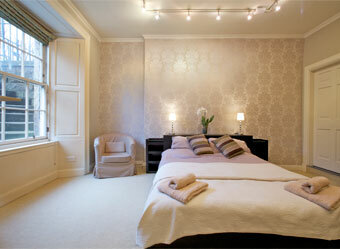 'Gorgeous appartment and fantastic location'.... Alice and Rob. 'Wonderful place and wonderful people'.... The Sinclairs, San Francisco. Minimum stay 2 nights. 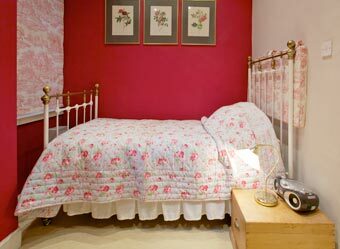 Prices include, bed linen, towels, electricity and central heating. Weekly rentals are usually Saturday to Saturday. Please tell Lucy you found her 58 Queens Street apartment through About Scotland!